Rep. Steny Hoyer in Israel with 26 Democratic congressmen, warns PA over September. President Shimon Peres held a working meeting Wednesday morning with a delegation of 26 Democratic Party lawmakers from the U.S. House of Representatives. The group is led by Minority Whip Steny Hoyer (D-Md.). The delegation is sponsored by the pro-Israel lobby AIPAC, and is the first of several delegations from both major parties that will visit Israel in the course of the month. The visits are part of what AIPAC says is a tradition designed to strengthen friendship between Israel and Congress. "It is a well known fact that Republicans and Democrats in the U.S. disagree about many things," Hoyer told Peres, "but there are central values about which there are no disagreements between the parties, and this is the case with Israel." 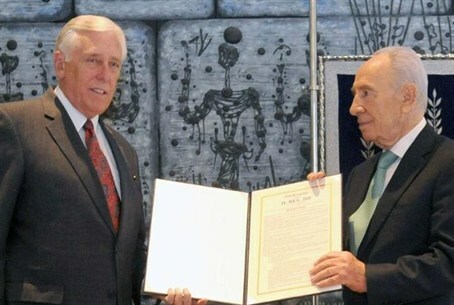 Hoyer presented Peres with a copy of a recent House decision that expresses opposition to a unilateral Palestinian Authority declaration of statehood in September. In case of such a declaration, the resolution states, cash aid to the PA will be cut off.